Your Home Could Be At Risk! When you clean gutters and downspouts, you protect your home from unnecessary repairs caused by neglect. Contact Aces Home Services to schedule a quick and easy appointment for your gutter and downspouts. On a well built home, the gutters and downspouts are almost invisible. Color-coordinated with the eaves, they just blend into the roofline. Moreover, out of sight easily translates to out of mind. Home maintenance and repair experts, including Aces Home Services, caution, however, you neglect your gutters and downspouts at your own peril. Under ideal circumstances, you should inspect your gutters and downspouts at the end of every summer, just before the rainy season, making sure they are ready for winter run-off and heavy spring rains. 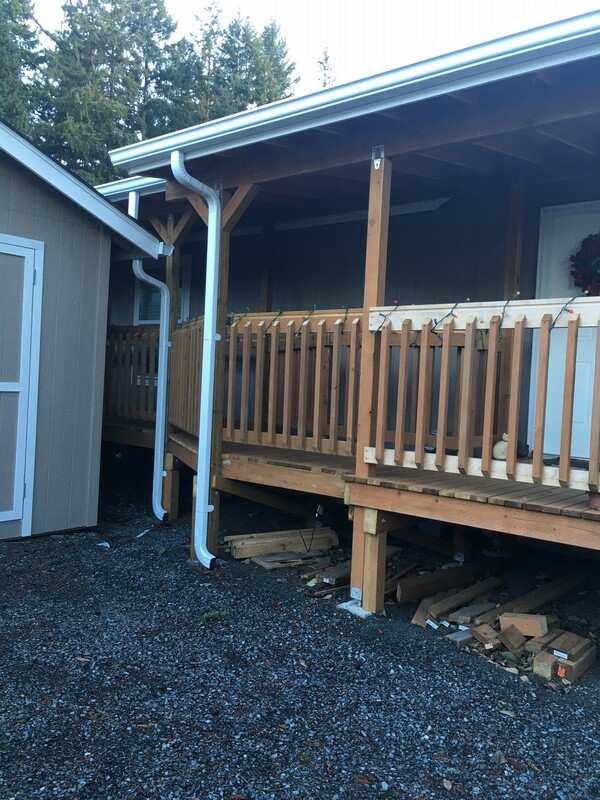 Aces Home Services will be happy to book an appointment at your leisure and convenience and we will come out and handle this gutter and downspout task quickly and efficiently getting your home in top shape. Another ideal time to inspect your gutters and downspout is at the onset of spring. After the wet winter you want to make sure your home is ready for those spring showers and Aces Home Services can and will be happy to accommodate your home in the springtime and all year round. Just give us a call at 425-324-4742 . Replacing gutters and downspouts before water damage occurs. Keep your home in good repair in order to maintain your property’s value and appearance. The reminder must seem painfully obvious, maybe even a little bit patronizing, however some homeowners do neglect repairs or make repairs in an untimely manner resulting in greater expense than necessary. Water leaking in gutters numbers among the leading causes of dry rot in roof decks—the heavy plywood that supports your shingles of tiles. Even if your roof is seamless and intact, dry rot in the deck can cause big leaks. Often the leaks damage not only roofs but also attic insulation and plastered ceilings. Neglect of a five-minute task can result in $10,000 repairs. Investing in professional replacement of your gutters and downspouts protects your bigger investment in your home, its safety, and comfort and avoids the big repairs later. Gutters are the primary mechanism for moving water off a roof and away from a home’s foundation. This may not seem like a big deal, but one inch of rain washing off the roof of a typical 2,000 square foot home can account for as much as 1,200 gallons of water. Based on the average rainfall for many regions of the country, that adds up to nearly 32,000 gallons of water per year — enough water to fill two average sized swimming pools! When gutters clog, water is unable to flow freely, which results in the gutters filling with water and cascading over the front and back edges of the gutter. Overflowing water will stream down a home’s exterior walls and seep into the ground below. If your home has a basement or crawl space, the water will find naturally occurring cracks in the foundation and enter the structure. If you have window wells, water can accumulate in the wells and seep through the window openings or broken seals around the window frames. As the ground becomes saturated, excess water will pool around the foundation until the ground can no longer absorb it. The presence of excessive moisture around a foundation can lead to mold and mildew problems, which are costly to remediate, potentially hazardous to your health, and can adversely affect your home’s resale value. Leaves and sticks clogging gutters, when left unchecked, clog gutters causing wood rot on your home’s boards, soffits, and eaves. When this occurs, gutters must be removed and that wood replaced resulting in more expense than necessary. Clogged gutters are also a popular breeding ground for mosquitoes! The simple way to avoid these problems is to clean your gutters on a regular basis or add gutter guards that will permanently keep leaves and debris out. Clean your gutters and downspouts whenever they are dirty! You would be amazed how many homeowners either overlook the task or discover that it is a lot more difficult and demanding than it seems. Especially if you own a two-story or multi-level house, gaining access to the gutters may be both difficult and dangerous. Moreover, if you have neglected your gutters for several seasons, you may discover cleaning them is a lot messier and more challenging than simply scraping-out old leaves, because mud and mold accumulate in the drain channels, and summer sun hardens them into premium adobe. If you have allergies, hay fever, or mold sensitivity, you may barely get to the top of your wobbly ladder before your sinuses and lungs react to all the airborne irritants floating just above and all around your gutters. Hiring professional cleaners for your gutters and downspouts may seem unnecessary, however, think of it as an investment in your health and welfare. Keep your gutters and downspouts clean to keep your eaves and roof in good repair. Water backed-up in gutters numbers among the leading causes of dry rot in roof decks—the heavy plywood that supports your shingles of tiles. Remember, Investing in professional cleaning of your gutters and downspouts now, can save you 10,000 later and protects your bigger investment in your home, its safety, and comfort.